Free Shipping Included! 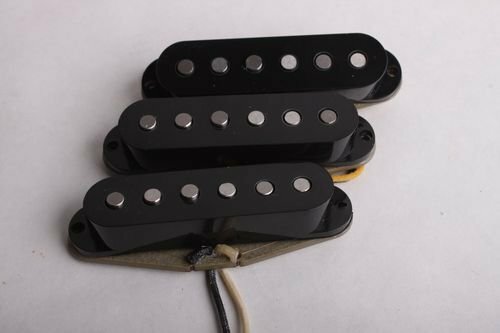 Storm - Vintage Strat Pickup Set by BYOGuitar at Tritone Guitars. MPN: BYO-STORM-SET. Hurry! Limited time offer. Offer valid only while supplies last. Storm - Vintage Strat wind delivering classic tone of late 50's. Warm, smooth tone. Prominent mids, clear and glassy highs and solid bass response. View More In Pickups & Pickup Covers. Storm - Vintage Strat wind delivering classic tone of late 50's. Warm, smooth tone. Prominent mids, clear and glassy highs and solid bass response. These are built stock with staggered alnico 5 magnets, and vintage spec heavy formvar wire. Grey fibreboard flatwork for a vintage look. The middle pickup is RWRP to achieve hum-canceling in positions 2 and 4. Vintage cloth lead wires, Vacuum wax potted. If you have any questions about this product by BYOGuitar, contact us by completing and submitting the form below. If you are looking for a specif part number, please include it with your message.